Search Marketing is currently going through an unparalleled evolution. Gone are the days of simply using a desktop computer and entering a search query into a Google browser. Those days are replaced by a consumer who is on the go, using mobile phones and tablets to search for products and services across not only Google, but also Amazon, Facebook, Twitter, Trip Advisor, and numerous other search apps and sites that are fighting for the eyes of the consumer. “Search marketing” now includes social, video, CSEs, native, TV, wearables, apps, maps, review sites, “things,” and cars—often without having said or typed. Engage based on contextual inputs like time, device, geography , demographic, interests, behaviour & prior brand interaction—even if a keyword wasn’t used. Today, we can reach well beyond the traditional search engine results pages. - Leverage customer data—reviews, likes, clicks, conversions—to create curated landing page/content experiences. - Seamlessly entwine your content into already curated spaces such as Pinterest Promoted Pins, and Yahoo! Native Ads. - Partner with bloggers and other influencers who curate products for their audiences. Search is a form of digital marketing that involves the promotion of digital brand assets (websites, videos etc.) by increasing their visibility in search engine results pages (SERPs), e-retailers and brand websites. Search marketing is about connecting searchers looking for information with the most relevant information available online. It encompasses both organic (SEO) and paid search (PPC). The keywords used in search campaigns can be brand terms to ensure visibility and brand awareness as well as campaign specific terms related to the launch of a new product or brand event that consumers may be searching for. SEO stands for Search Engine Optimisation, the process of improving the visibility of a website or owned asset on organic SERPs, by incorporating search engine friendly elements into a website. High quality links to other sites. A website audit should be the first thing carried out to assess what needs to be addressed. A site needs to be friendly to search engines for successful indexation. Ensuring indexation by search engines takes place is always the first step in an SEO strategy, because if content cannot be seen by search engines, it will never appear in search results. The title tag element is critical to both user experience and search engine optimisation. This is because it will be judged by users as the very first thing they see in the search results pages to determine whether a page will be useful to them or not. It will also be used by search engines to determine what the page is about. Google comes down hard on websites with spammy links, so it is crucial to link to reputable websites. In the past, Google has penalised websites with poor practices - resulting in lowered search rankings and sometimes even being completely de-indexed. It is therefore important to keep up with changes in Google’s algorithm when they are announced and adhere to best practices in SEO. Every website must be optimised so consumers are given a good experience on their mobiles and are therefore more likely to convert (for example by making a purchase). Performics predicts that by the end of this year, mobile search volume will outpace that of desktop and Google is continuing the trend of trying to push brands to focus on mobile. On 21 April 2015, Google expanded "mobile-friendliness" as an organic ranking signal, which (according to Google) will have a "significant impact on search results". Making it easy for people to discover relevant content, optimised for their devices, is now critical to driving results and Performics is closely monitoring the effects of these recent changes. You can check if your website is mobile-friendly on Google Developers. Content marketing has become an increasingly important part of an effective SEO strategy and quality content can drive partnerships, which in turn delivers increased visibility, ranking and consumer engagement. Google is designed to give the user the best content for the particular search term they’re looking for, so the most efficient, cost effective and natural way to rank for desired search terms is to own the best content on the web for that particular search term. Consumers want useful content and visitors will spend longer on your website if you provide content that they want to read. Good content also helps increase traffic and encourages people to share your site via their own sites, social media and social bookmarking sites. PR, brand mentions and existing links should also be optimised to drive brand equity and bring traffic to your website. Infographics and visual content display data in a visually compelling way in order to tell a story through an image. They can be very popular as a form of content marketing, and are easily shareable. 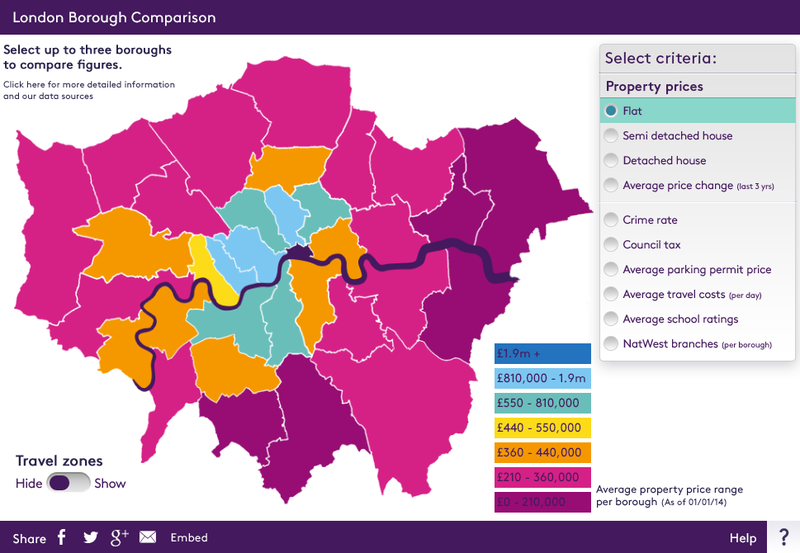 Performics worked with NatWest to produce the London Borough Comparison tool and content marketing was key to its success. The tool was shared or references by bloggers, estate agents, national newspapers and online news sites, leading to a 38% increase in non-brand traffic. We also achieved a climb to position three of the search rankings from page two for the most important search term. PPC stands for Pay Per Click. These are non-organic search results also referred to as paid search results. PPC is the process of gaining traffic by purchasing ads on search engines. 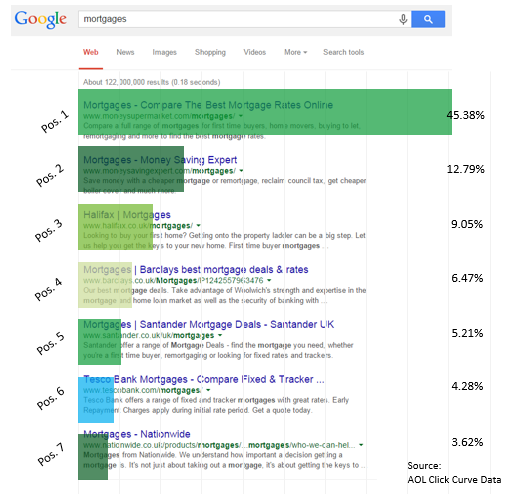 But how does paid search actually work? In paid search, changes to bids and budgets require very little lead time, and adjusting campaign bid strategy or pausing a set of keywords can provide a performance improvement in a matter of hours. Winning is not only about the bid price - positions on the page are ultimately based on a number of factors. A combination of bid and relevance (measured as ‘quality score’) is used to determine where your ad appears on the page. Every time a search is carried out, Google will compare these factors for you and all other advertisers who wish to appear. A strong relevance (quality score) can result in an advertiser paying less to appear higher up the rankings. Therefore improving quality score is an effective way to raise ad position, while controlling costs. 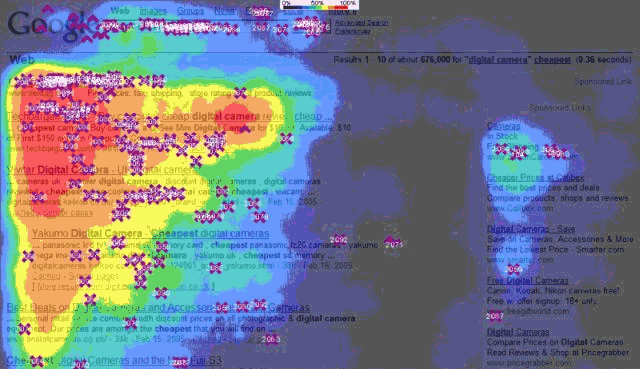 Example: A large percentage of clicks go to the paid search results , as seen on this eye-tracking heat map. Consumers are searching for your brand day and night, over the weekends and on public holidays. Research shows that consumers focus on the highest results on search engines and 75% of users never scroll past the first page. It is therefore imperative that your brand is visible when they search or you could risk losing them to a competitor. A strong presence in paid search allows immediate control of the brand experience and an opportunity to appear as category leaders for specific terms that are important to your brand. Over time we can optimise key pages within the site for high volume keywords, and when these pages rank highly in organic search terms, we can then reallocate the paid search investment to other lower performing keywords in order to attain and maintain a high share of impression. With the ever changing device landscape and mobile usage on the rise, it is no longer about ranking in the top 10, but the top five at minimum, and the top three on mobile. This is why it is more critical than ever for marketers to ensure their websites are SEO-friendly. Desktop and tablet are similar and have the same number of paid opportunities. For mobile, smaller screens create more competition for ranking in paid positions. Paid and organic results share the limited space, therefore ranking in the top positions prevents losing out against competitor brands. Understanding where you are ranking both organically and in paid search allows you to optimise bid strategies to maximise brand presence and beat competitors to the top positions. Example: Click-through rate tails off the lower down the rankings the website is. An integrated PPC and SEO strategy is the most cost efficient and effective approach to managing search. Ongoing campaign management is important to optimise campaign performance and data can be used to determine which tactics work across both channels to exceed KPIs and achieve high ROI.